L.A. shoe designer Maddie Springer hasn't seen her father since he reportedly ran off to Las Vegas with a showgirl named Lola. So she's shocked when he leaves a desperate plea for help on her answering machine - ending in a loud bang. Gunshot? Car backfire? Never one to leave her curiosity unsatisfied, Maddie straps on her stilettos and, along with her trigger-happy best friend, makes tracks for Sin City in search of her MIA dad. Maddie hits the jackpot, all right. 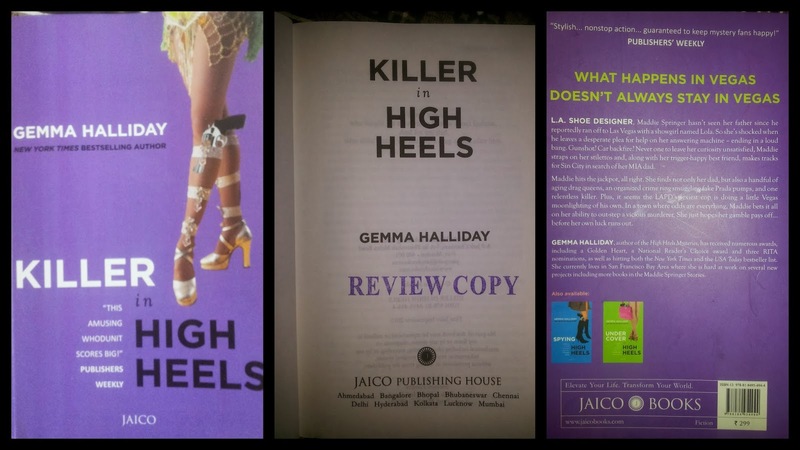 She finds not only her dad, but also a handful of aging drag queens, an organized crime ring smuggling fake Prada pumps, and one relentless killer. Plus, it seems the LAPD's sexiest cop is doing a little Vegas moonlighting of his own. In a town where odds are everything, Maddie bets it all on her ability to out-step a vicious murderer. She just hopes her gamble pays off... before her own luck runs out. The USP of this series is that though the book belongs to the genre of mystery, it is dealt in a very chic-lit way. So there is humor and fun apart from the light-hearted take on things. The words flow effortlessly and it reels right in front of us. The editing is commendable and therefore there is not a moment that would evoke boredom. I liked the romance track between Maddie and Ramirez. It seems so real. The way Maddie behaves towards Ramirez is very relatable; you-ignored-and-see-I-can-also-ignore-you types! Every girl would have done this with their loved ones at point or the other, agree? Then, Dana… I adore her. She is self-obsessed and takes life as it comes. She is funny and comes up with bizarre ideas. I like the way she speaks. And her “Ohmigod” is a part of my smartphone dictionary! You have to read the 1st book in the series to read this one! This is yet another chic-lit with a thriller edge!